Tour through Managua historic center, includes Peace Park, Palace of Culture, Old Cathedral, National Theater and the Park Tiscapa Hill where you´ll have the opportunity to practice Canopy and enjoy the wonderful view of Managua. 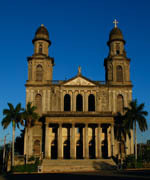 Cultural activities in Managua´s nightlife. 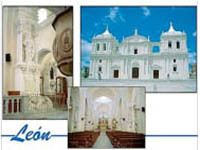 We continue our journey to the Western city of Leon, before arriving in the city we make a stop in the Ruins of Leon Viejo,important site for nicaraguan history, we follow an obligatory stop to taste the delicious quesillos in Nagarote , arriving in Leon city we´´e going to visit Central Park and the Cathedral considered a jewel of Latin American architecture, tour also includes other important churches, visit to the museum house of Ruben Dario Prince of Castilian letters and then visit the Gurdian Foundation Museum which has a large sample of national and international pieces of art. 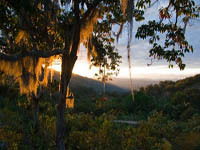 The tour continue to the northern city of Esteli, which has a pleasant climate, there we visit the Nature Reserve of Miraflor , where you can enjoy hiking, horseriding, waterfalls, butterfly garden and orchids and the most important you can share with local people, for sure a totally enriching experience. 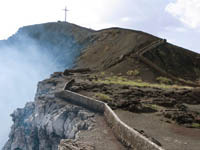 In the morning we visit Granada islets, where you can take a tour by kayak and enjoy the spectacular view of the islets, wildlife and the breathtaking view of the Mombacho volcano , then back in town a visit at San Francisco convent and Museum. The next day we continue exploring the tropical beauty of Nicaragua, this time our destination is the Mombacho volcano, which is located just minutes from downtown Granada, there you will have the opportunity to practice canopy in a coffee farm and enjoy panoramic views in the reserve. Returning we make a small tour in the white villages cradle of artisans, as well as enjoying a walk in the Mirador de Catarina, which offers a breathtaking view of Apoyo lagoon. 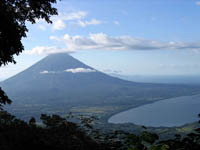 The adventure continues, this time we came to Ometepe Island of great natural beauty recently nominated to be one of the new wonders of the natural world is an island with two active volcanoes in a freshwater lake during the stay can experience the adventure to climb the Maderas Volcano, visit the San Ramon waterfall, look at the petroglyphs and relaxing in the calm waters of the Charco Verde lagoon , place of legends and beautiful scenery. And you can not leave Nicaragua without enjoying its fabulous pacific beaches in this part of the tour we headed to San Juan del Sur, a beach in the Pacific Ocean favorite among visitors, you will enjoy the culinary, hiking, boating and Travel to the beaches around like El Coco, Marsella, depending on the season (June to January) you will have the opportunity to see the arrival of marine turtles in la Flor beach, they come to the beach each year to lay their eggs. Returning from San Juan del Sur we visit the picturesque town of Masaya, where you can make purchases at the craft market and visit the National Park Masaya Volcano . NOTE: If the visit to masaya matchs on Thursday you can enjoy a cultural show call Noches de Verbena in Masaya craft market. DAY 14: The adventure is over!